Life has been really crazy lately so blogging has taken a back seat. First my computer crashed and then I started working part time. Once I got the computer back up I just felt so overwhelmed with how much I had not blog that I just let it all go. 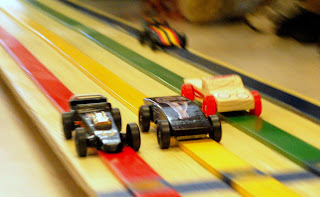 I guess a good Pinewood Derby race is as good of a start as any. 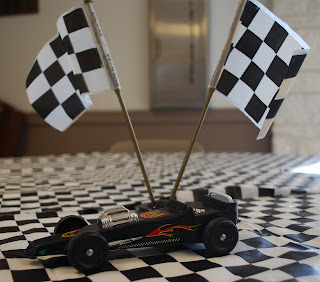 Cole's Cub Scout Pack had their annual Derby race this past Sunday. It is funny how a little car develops from just a block of wood. 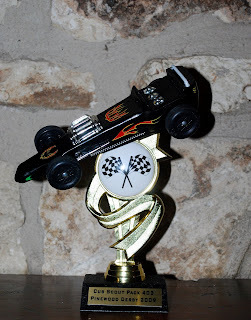 This is a picture of Cole's car and trophy. Rob made the car so it could sit on top of the trophy but still be able to take it off so Cole could play with it. Cole with his trophy and car after the race. 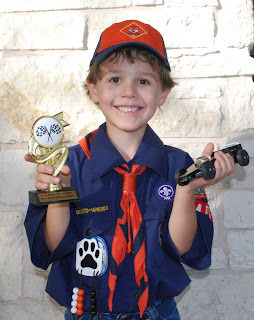 He was a very proud little Cub Scout. Cole's car is in the red lane and was neck and neck with the yellow lane car. He actually "won" first place in this race. Everyone got a trophy though ;) !! Welcome back to blogging Leslie!~ Does Cole lover being in cub scouts? That looks like so much fun for him.